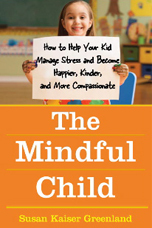 Susan Kaiser Greenland, author of acclaimed book The Mindful Child, has been teaching mindfulness to children for over a decade. Originally working as a lawyer in New York City, she was introduced to mindfulness and meditation by her husband after he was diagnosed with a serious medical condition. Together with their daughter, they moved to upstate in order to help him recover (which he did). 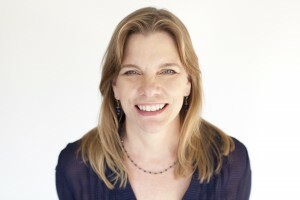 And later, Susan moved with her family (now including her second child) to Los Angeles, where she began teaching mindfulness to children more formally. In 2000, she began developing the Inner Kids Foundation to offer mindfulness training to inner city schoolchildren. Together with researchers from UCLA (my alma mater! 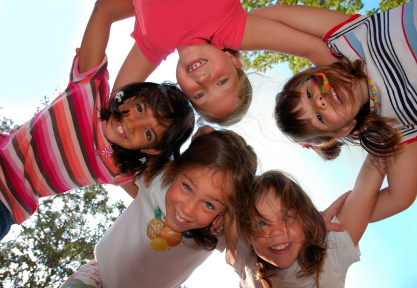 ), she studied the effects of her program in a randomized, controlled trial of 2nd and 3rd graders. Results revealed improved executive functioning (e.g., emotional regulation, attention, etc.) in the children who demonstrated the most difficulties in these areas prior to participation in the study. This finding suggests that mindfulness training might be powerful intervention for children diagnosed with ADD/ADHD. Susan is a gifted pioneer in teaching mindfulness to children and teens, and I highly recommend her book and her forthcoming workshop with Sharon Salzberg (another one of my favorite people!). On October 16th, Susan and Sharon are leading an all-day workshop on “Mindfulness with Children” in New York City. Fortunately, I had an opportunity to correspond with Susan recently, and I asked her some questions about her work. JSK: What technique or approach is the best way for parents to introduce mindfulness to their children? SKG: One thing we know for sure about this work is that there’s not a one-size-fits-all technique/approach that is best for every situation. But certainly the wisest thing for parents to do is to develop their own personal practice, and once that happens the rest will evolve naturally. In your work with children, which approach or technique has emerged as the consistent favorite? Shifting awareness away from an emotional upset to a sensory experience as a way to calm down when someone is upset. Breath and sensory awareness while lying down. What has been one of the sillier moments involved in teaching mindfulness to kids? I use the prompt in my Pre-K through elementary school classes “If you could have a sensory superpower what would you chose and how would you use it to help the world?” and have gotten some wonderfully crazy answers. If we could develop sensory superpowers, we would have a lot of creative child superheroes using their senses of taste, touch, smell, sight and hearing to fight crime, clean up pollution, and save the world in many original ways. What has been the most rewarding aspect of teaching mindfulness to children? Hard to say. Guess there are 2 areas that standout – the first is in connection with specific kids and seeing how quickly they are able to take simple mindful strategies and apply them/integrate them in to their daily lives to help during those times growing up where life can become complicated or difficult to navigate. And the second is more of a meta aspect of mindfulness and children, just watching the field expand as quickly as it has expanded and take-off the way it has taken off. What started a decade ago as a handful of people is now an authentic grassroots movement that is taking root worldwide. Those of us who have been in it from the beginning are happily watching this next group of teachers pick up the baton and run with and integrate our early work into their professional practice in ways that we couldn’t have imagined a decade ago. Like anything that is looking to transform communities and systems, this work takes a village and right now there are many strong teachers and programs but they are spread out all over the place and exhausted by the pace and the demands of the work. There needs to be some big-picture thinker/funder to step into the sector and seed true field development with an eye toward building alliances and providing an incentive that encourages collaboration. There are some rumblings that this is starting to happen, and if it does in fact happen, and people begin to work together rather than separately, I think all of us will be pleasantly surprised by how quickly this work is integrated into the mainstream. Increasingly, I’ve seen Buddhism implicitly reflected in the mindfulness programs and exercises offered to children, and I wonder about this phenomenon. Would you speak a little bit about the role of Buddhism when teaching mindfulness to kids? I joke about how there’s a lot of fear about mentioning the “B” word, or Buddhism, in a secular context and there’s no reason to be afraid. In fact, I know from my old days as a law student and moot court that the best strategy if you’re arguing a position is to spend your greatest effort preparing your argument for what you view as your weakest position. The Buddhist foundations/applications of the secular mindfulness work can be a great strength rather than an Achilles heel if reframed as a well-established, evidence based training protocol shown to reduce stress, improve immune function, develop executive function and attention with measurable results when it comes to changes not just in the health and wellness of the individual but also in the likelihood of an individual who has undergone that training in engaging in social, compassionate action. Many of my adult blog readers live and work in cities, and their lives as parents are incredibly busy and chaotic. What practice or insight have you found to be the most helpful for stressed-out, urban parents? I have a colleague who has attended a number of trainings by Mingyur Rinpoche and she told me he often teaches “short-time, many-times” which I think may be one of the wisest teachings around for those of us leading hectic lives. You’ll be teaching an all-day program with Sharon Salzberg at the New York Insight Center on October 16th. What can participants expect from the workshop? In the morning Sharon is going to lead a half day of meditation touching briefly on concentration, mindfulness and compassion. In the afternoon I’ll take each of her points and offer an adaptation or two for children that track the classical practices in an age-appropriate and secular way. If you have any interest in teaching mindfulness to children--your own kids or others--then I strongly encourage you to come to the workshop. I (JSK) will be there to learn more about developmentally appropriate teaching methods for mindfulness (please flag me down if you come!). Here is the website for registration: Mindfulness with Children. I really hope to see you there. If you’re unable to come, I encourage your to visit Susan’s website (complete with video demonstrations), blog, and/or the Inner Kids Foundation. To UM readers, I hope that you'll excuse my unannounced hiatus from blogging. For the past few months, I have been prioritizing other pursuits: reading (vs. writing), listening (vs. speaking), parenting (vs. working), and being (vs. doing). This has proven to be a very helpful and enriching practice. The stillness that accompanies mindfulness practice allows for the natural arising of many things: emotions, thoughts, physical sensations, and particular human qualities. In particular, I've taken notice of the ways in which compassion surfaces as a way of considering and treating others. There are some meditations that specifically cultivate compassion (such as metta meditation within Theravada Buddhism) and psychotherapies that promote its expression as well (e.g., naikan therapy and compassion-focused therapy). It also becomes present for us when we allow ourselves to see the inherent sufferings and joys in the world, less mediated by our own psychological baggage. We care genuinely for others, and are more prone to ask "Are you okay?" or "How can I help?" as opposed to "What's wrong with you?!" Interestingly, I've seen this same kindness being expressed naturally in young children as they play with each other. This observation prompted me to recall an anecdote from Fred Rogers (Mister Roberts to you and me), delivered as part of a commencement address a year before he died. I've saved the New York Times clipping of this story for almost a decade now, and I'm happy to share it with you (it's mid-way down the page): Mr. Rogers on compassion. I hope you like it. Already, Mindful Schools has introduced close to 10,000 children to the practice of mindfulness. There are several other organizations and individuals on a similar mission, including MindUP, Inner Kids, and A Still Quiet Place. If you're interested in helping children learn mindfulness, then I'd encourage you to check-out some of these programs.